The web design industry is continually changing. Our web team is constantly staying in the know so that we can update and integrate trends to create websites that stand the test of time. Here are a few trends you should be watching out for in 2019. Instagram for instance, rebranded their logo into their current gradient and people noticed. It was drastically different from their previous style, but their decision impacted design and led to a popular design choice among web developers – designs with gradient. Experimenting with typography is something to be expected from designers. As coding becomes more refined, experimentation with typography on the web has become increasingly common. This leap forward could include cutting or purposely subtracting parts of letters and words, animating typography, photography inside typography, and other interesting designs. GIFs work on almost all browsers and mobile devices, making them available to everyone. GIFs can convey elaborate ideas in a short period while being appealing and entertaining. Websites are using GIFs to retain user’s attention. In the past, web designers put a lot of emphasis on a set grid. This grid system would help designers maintain consistency and alignment throughout the design. However, more recently we are starting to see designers break outside of that standard grid. Designers are able to have more creative freedom with their work and create another level of hierarchy on a page. This extra level of hierarchy is beneficial when it comes to leading the user’s eyes down the page and pulling them into the quintessential actionable parts of your site. An organic shape is an imperfect shape; it is irregular and uneven. They appear more hand-drawn and humanistic. With their unusual form, these can be used to grab a user’s attention. When used in tandem with an illustration or image, they also add an excellent level of depth to your site, breaking up the monotony of the same circles and squares that we’ve gotten so used to seeing. Color is an essential element in a website. It unifies a brand and guides users through an interface by creating visual landmarks. 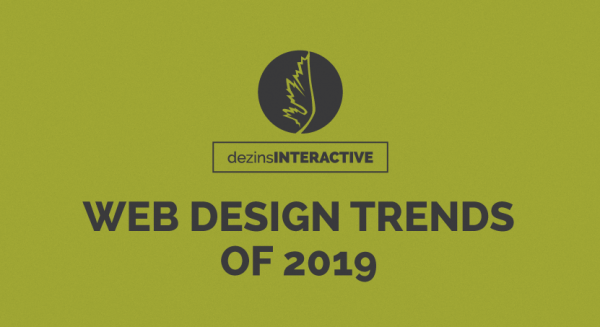 However, for 2019, we’re seeing bold black-and-white web design making dramatic statements. Ironically, the most significant effect black-and-white designs have is in their combination with small amounts of color. Adding an emphasis color will break up the sea of monochrome; making points of interest and calls-to-action leap out. There you have it. It’s the final year of the decade and web design is laid out for you, except for one thing: it hasn’t all happened yet! There are still countless surprises in store and lots of time to contribute your ingenuity to the list. As much as we’d like to imagine that we know what 2019 will bring, it is ultimately up to you. This year, let’s choose to maximize our creativity.